How to access custom fields admin area. How to edit custom fields. In order to manage or create custom fields, you first need to go to it's management page. Click on Configuration from top navigation menu. Click on Create Custom fields link from left menu and you will a form with type of fields to be created, details, visibility at "Issue" or "User Story" and project. 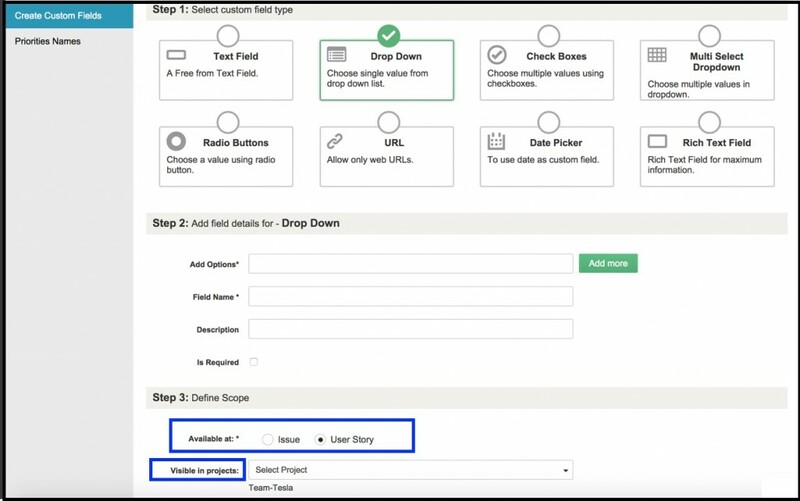 There are 3 steps to create custom field Step 1: Select type of custom field you want Step 2: Provide values, name, description and select if it's "Is Required", means it's MUST field Step 3: Decide, whether it would be visible only at Issues or User Stories (currently it can only be visible at one type of item), if you need at both, then you need to create 2 fields. Also, decide, under which projects this custom field would be visible.